Its funny how things workout sometimes. This is actually personal project, but it went to print in couple of different formats. I decided to I wanted to build my own guitar from a kit, and after a bit of shopping around I decided on a telecaster shape. 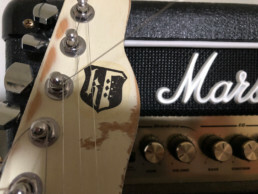 I started out doing some research on how to put it together, then came up with a direction on how I wanted it to look – a heavily reliced (distressed) simple white guitar with black stripe. This is where I got stumped with my project, I couldn’t move forward without a logo. The designer in me took over and two weeks later I had this logo and it has gotten great reviews. 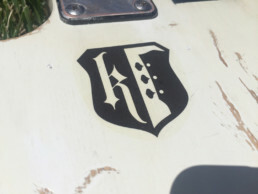 While I have no major plans for this logo, so far it has gone onto three guitars, as well as shirts and sweatshirts. A fourth guitar is in the works, we will just have to see where it goes from there.